On Thursday, July 2, four people were arrested after a search warrant was executed at a residence in Smithfield Township. The search warrant resulted from an investigation that started in 2014, and was executed by Pennsylvania State Police in conjunction with the Monroe County District Attorney’s Office and Monroe County Children and Youth Services, along with Monroe County Domestic Relations. The four individuals arrested include 48-year-old Denise Miluszewski and her son, 28-year-old William Miluszewski, 45-year-old Richard Leepin, and 29-year-old Donna Wynings. Denise Miluszewski was reportedly in a rehab facility for an alleged heroin addiction when investigators learned that her son, William, was “running” the drug business while she was in rehab last year. Three young children lived at the address where the search warrant was executed; all have been placed in foster care. Investigators began watching William’s travels in which he allegedly picked up heroin in large quantities after learning that his mother was bragging to inmates and Corrections Officers about how well William was handling the business. With the help of an informant, investigators purchased heroin from the Miluszewski’s on several occasions recently, noticing the younger children would be outside playing while they were engaged in the drug transactions. Upon searching the Smithfield Township residence, investigators found a shot gun, two 30-30 rifles, a 9mm handgun, additional firearms, about 350 bags of heroin, approximately $5,000 in cash, and property including jewelry, ATV’s and other items believed to have been purchased with drug proceeds. All four have been charged with possession of heroin, possession of drug paraphernalia, endangering the welfare of a child, conspiracy, and possession with intent to deliver a controlled substance. These four individuals face very serious criminal charges. In many states, a conviction for possession with intent to deliver/distribute will result in a substantial number of years in prison, or even life behind bars. In Michigan, possession of 1,000 grams or more of heroin may result in a life prison term. In most cases, factors that affect sentencing include the type/amount of drug involved, and the individual’s criminal history. 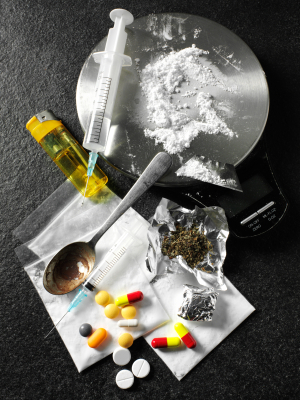 If you have been arrested on drug charges or are under investigation, do not hesitate before consulting with a skilled Michigan drug crimes attorney. Your freedom is at risk; your entire future may be in jeopardy.